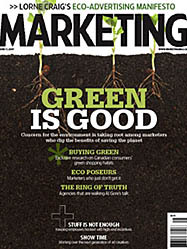 This article originally appeared in Marketing Magazine June 11, 2007 – These days it seems you can’t swing an endangered sea turtle without hitting an article, news item, book or celebrity endorsement of the world’s new-found environmental awareness. 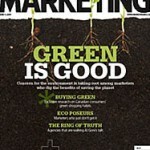 But when the green-tinted dust settles, what will it all really mean to our global economy–and more importantly, to the world of marketing and advertising? After all, our trade, as we know it, was invented in the Golden Age of Consumption. Bigger was better, disposability was our birthright and there was no foreseeable shortage of atmosphere or landfill space to absorb all the methane we could generate. The giants of our industry cut their teeth creating needs where none had theretofore existed. When needs were met, they plied compelling social pressures, minted demographic trends, and even generated phobias to propel the economic juggernaut ever forward, ever faster. What fun! More martinis! But today, as if the increasingly sub-molecular dissection of ROI wasn’t enough, we’re forced to question every expenditure of energy and resources. Our most cherished brand institutions come under increasing scrutiny for everything from sweatshop labour to the forest-certified paper on which they print their fresh green manifestoes. Clients look hungrily past the “creative solution” to grassroots word-of-mouth, street teams and the Holy Grail of the self-propagating online viral campaign. Heck, thanks to iMovie and YouTube, we’re even pitching creative against our own consumers. So what’s left for an honest ad guy out there in the bleak green landscape? In the short term, lots. We’ll be busy publicizing first-generation eco initiatives, calculating saved CO2 emissions for expressions of self-congratulation and driving demand for recycled paper and vegetable-based inks. But once that low-hanging fruit has been taken, the real work begins. Because the real change required to stave off our self-generated drive to extinction will require the biggest attitude shift in modern history. Our task is to take a society built on greed, power, accumulation, fantasy, laziness, apathy, jealousy, reality TV and fifty other undesirable nouns, and sell it on responsibility, sacrifice, hard work, efficiency, dedication, fresh air, caring, sharing, local produce and public transit. For ordinary mortals, perhaps. But we are The Marketers and Advertisers (cue Pomp and Circumstance soundtrack). No one can dissect, dismantle and re-engineer the human psyche like a cubicle-farm full of marketing MBAs. A gaggle of Cannes-hungry creatives will break through clutter faster than Martha Stewart prepping for a garage sale. And not even a carpet-bombing fleet of B-1’s can transform a landscape like today’s borderless media departments. Yes, if anyone can sell the world on a verdant prescription of planet-friendly panaceas, it is us. It is time to take our darkest, most persuasive powers and turn them towards the light. This battle for hearts, minds and planetary consciousness will be fought with large accounts and small. Through strategy, headlines, images, music, video, guerrilla postings, blogs, vlogs, podcasts, RSS, SMS, web-based promotions, and yes, even the judicious use of consumer generated content. Will we still work way too many hours pickling ourselves in way too many toxins, spend sunny weekends we will never get back tweaking details no one but our peers will ever notice and fight tooth and nail with middle managers, suits, creatives, regulatory bodies, clients and their wannabe-designer-spouses to preserve a powerful idea? Does the Jolly Green Giant wear biodegradable briefs? But this time the stakes will be higher than just another point of market share, marginal raise or creative trophy. Winners in this Herculean undertaking will each receive one six-billionth share in a slightly used, but still serviceable planet. Free and clear. Smart Car with fins? I’ll take one. With optional biodegradable fuzzy dice, if you please. And fill ’er up. Previous: « Greenworks Building Supply – Doing it right.